описание (ru) Office Timeline Быстро создаёт профессиональные визуализации этапов проектов. Office Timeline создан специально для создания временных шкал прямо внутри Microsoft PowerPoint. Он легко создает изящные диаграммы Ганта и временные отрезки. 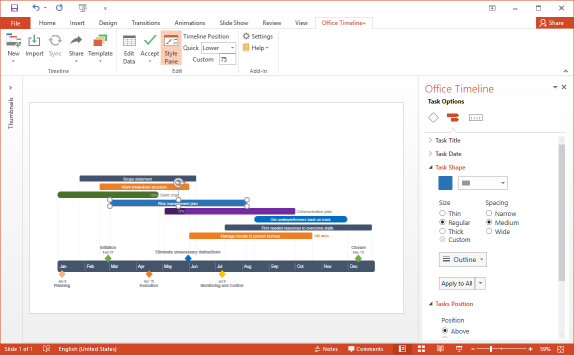 description (en) Office Timeline PowerPoint timelines made easy! Create beautiful timeline or Gantt chart slides for important presentations with our free, award winning timeline maker. Creating stunning timelines in PowerPoint is easy! Simply pick the timeline style or template you want, enter or import your project’s data, and click Create. It's that simple! Improve project communication with stunning PowerPoint timeline slides that can be viewed, edited, and shared by anyone who has Microsoft Office. Office Timeline’s seamless integration into PowerPoint makes it simple to present project plans or Gantt charts in a way that important audiences expect – and easily understand.